Few places on the male body reveal more personality than the ends of the arms. Whether it’s a wedding ring, a cherished signet or a statement-making watch – as men, we seem to wear our hearts just below our sleeves. Wrists have always been the focal point of this showcase of individuality, a place to exude not merely status and wealth, but also taste, style, an appreciation of craftsmanship and even a flash of colour. The wrist has always been a refuge from uniformity. And yet up until now, jewellery on the male wrist has remained somewhat taboo. A watch? Yes. But a beaded bracelet? God forbid. An odd contradiction, considering the vast array of stylish gentlemen, past and present, who sport a variety of materials and designs in bracelet form. Granted, at times it’s difficult to miss the amassed decoration on the arm of Harry Styles or Johnny Depp, but look a little closer and you’ll also spot timeless bands on the likes of Paul Newman, James Dean and Elvis. It’s all in the details you see. 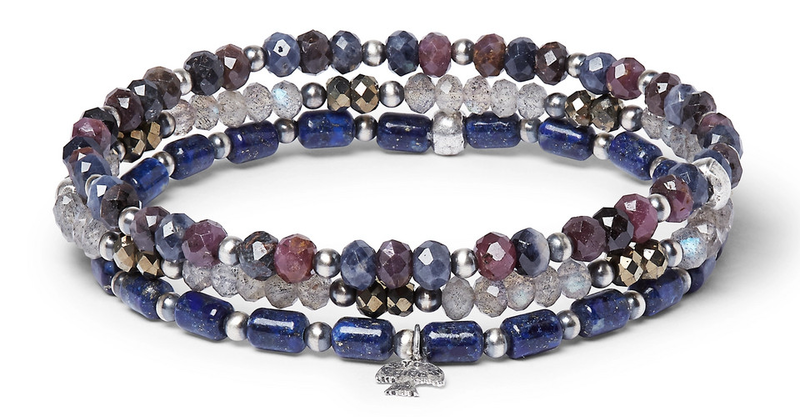 That’s where the beauty of the beaded bracelet lies – in the small details. 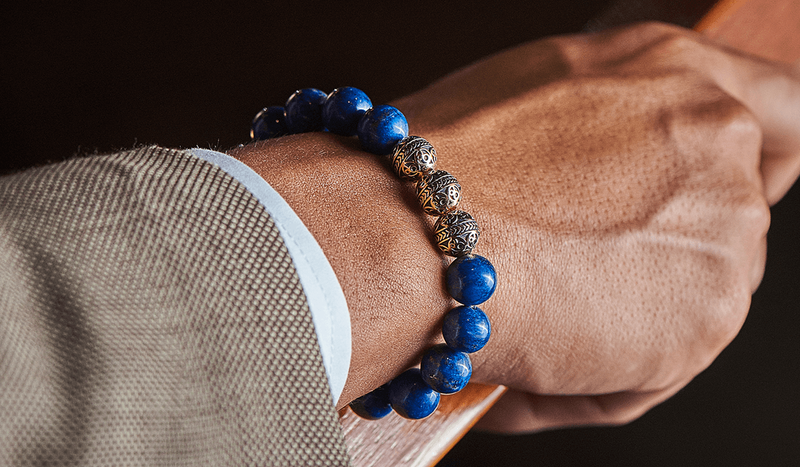 Whether you’re looking for a flash of colour to set off a suit or a neutral design to provide a carefully curated detail on a bare arm in summer, a luxury beaded bracelet is a key accessory most men miss. To help put it right, we’ve carefully selected nine luxury brands worth knowing about when it comes to beaded bracelets, with an emphasis on design, quality construction and premium materials. You can’t mention luxury men’s jewellery without touching upon Azuro Republic. Priding themselves on a dedication to finding the most unique and high-quality minerals worldwide, their designs mix playful dashes of colour with stunning craftsmanship. Daring shades, such as blue (see: Gold Classic Lapis Lazuli) are all represented in their collections, but for a modest and understated piece, look no further than the Silver Classic Apollo. The detailing on the piece is a testament to the brand’s 30 years of innovation and 18 different crafting methods. Azuro Republic are really going after the stylish gentleman community. A masculine feel, suitable for everyday wear, makes their designs a classic addition to any style-conscious man’s collection. Each bracelet has a different meaning, not only a different design and colourway, so you can truly match your personality, occasion and outfit to a bracelet. It’s also worth noting the level of detail Azuro Republic go to, which stretches to the origin and background of the stones used. Take the hand-picked and shaped stones of the Gold Classic Lapis Lazuli (representing blue sky and bright stars) above, for example. Lapis Lazuli is a rare kind of stone unearthed 6,000 years ago in Afghanistan. It implies the wearer possesses the quality of unselfishness and generosity. When it comes to style, if in doubt, look towards the Italians for inspiration. And you guessed it, they’re wearing beads. If you need proof, look no further than Neapolitan tailoring powerhouse Isaia and the brand’s iconic chief exec, Gianluca Isaia. One of the best-dressed chaps in Napoli, Gianluca can often be spotted wearing the brand’s Coral Charm Bracelet. The vivid red beads and signature coral branch in sterling silver are an ode to the city’s mythical relationship with the ocean. The Luis Morais brand was born from a feeling of want. 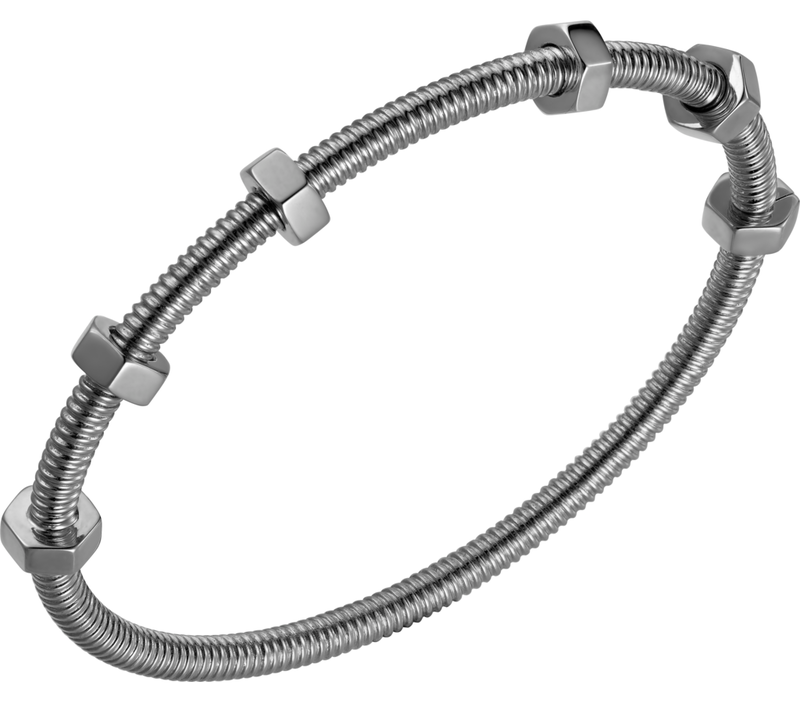 Having seen a bracelet in a magazine, Morais searched high and low in an attempt to purchase it and when he couldn’t, he made a version of it himself. The DIY design garnered attention and compliments from friends and family and so the brand was born. At the core of Luis Morais’ jewellery is a rock ‘n’ roll spirit, mixing playful and classic elements. Inspired by journeys, notably expeditions and adventures in search of high-quality and varied materials, Mikia is a Japanese jewellery brand established in 1998 by Aki Mitsubayashi. Designs are minimal and contemporary with a unique feel to each piece. The brand’s silver-plated, shell and magnesite bracelet is a modest and sophisticated option that’s sure to attract intrigue. Established in 1974, Santa Fe-based Peyote Bird blends cultural influences with artisanal design to produce stunning jewellery for men and women. Handcrafted and designed by an array of local artists, designers and craftspeople, their pieces evoke native and south-west American heritage with truly unique results. A true behemoth in the luxury jewellery game for both men and women, the Thomas Sabo brand is one associated with the world’s finest silver. Bold, luxurious design meets the finest materials and their penchant for rock ‘n’ roll flair is always present. Thomas Sabo beaded pieces can be dressed up or down, providing the perfect accessory for immaculate suiting or a rebellious evening look. A French luxury house that needs no introduction, Cartier is a brand to be seen wearing. 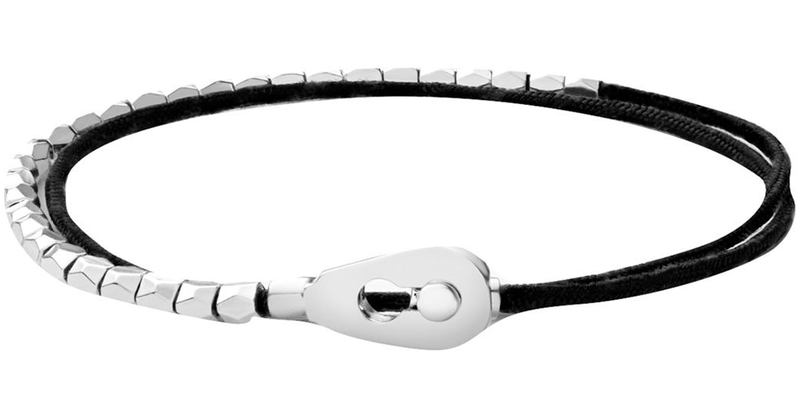 For a decadent take on the beaded bracelet look no further than their signature Ecrou De Cartier in white gold. Effortlessly stylish with a notable weight and feel of quality, it’s difficult to find a piece more at odds with the beaded bracelet stereotype. A brand with creativity at its core having been established in New York City by a sculptor of the same name and his wife Sybil, a painter. What started as a creative exercise has since expanded into one of America’s foremost luxury jewellery and watch makers. Central to the brand is its spiritual influences and innovative use of materials. If you’re in search of modern, versatile and timeless design in your wristwear, look no further than Miami-based jewellery brand Miansai. With explicit nods to exploration and all things nautical throughout their collections (custom-made marine grade ropes are present throughout), the attention to detail and elevated design makes each piece stand out. Their intricately woven bands whether steel or leather speak for themselves. 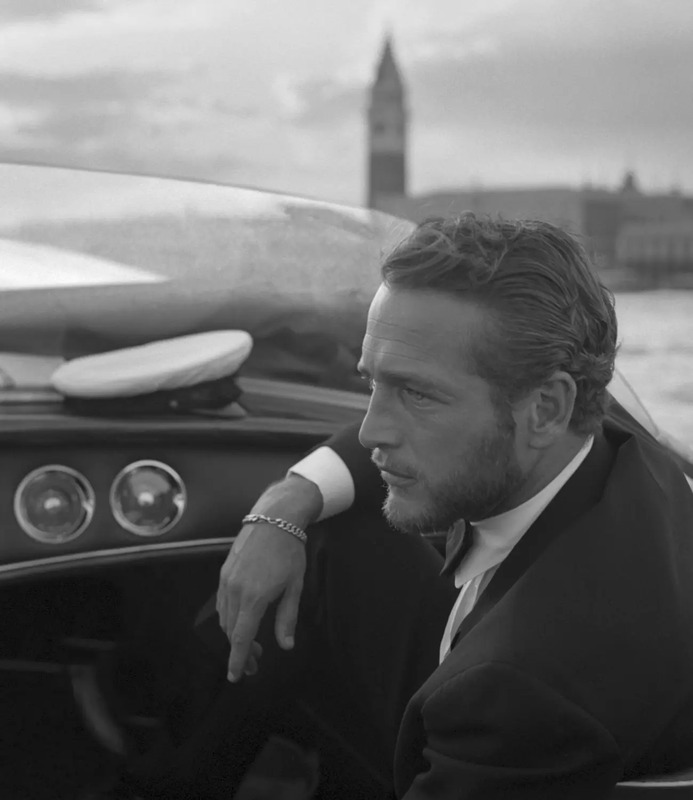 Gone are the days when a watch was the only legitimate piece of jewellery a well-dressed gent could wear. Not to be forgotten, a luxury timepiece is still an essential, as are a man’s shoes, but with the likes of Azuro Republic, Miansai, Cartier et al. 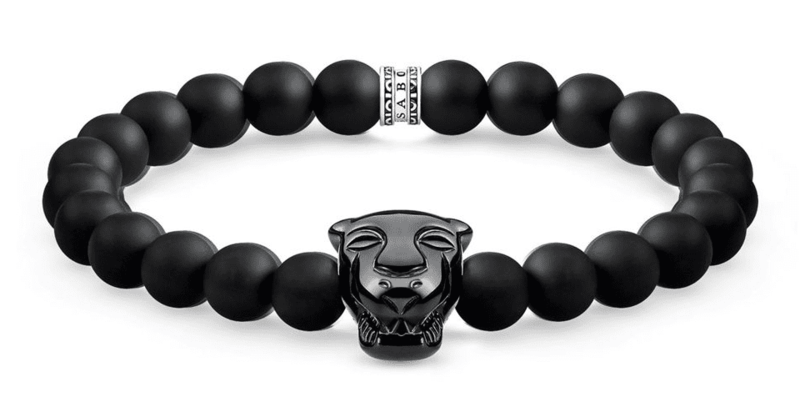 pioneering a new frontier in wearable, masculine bracelets, they have become a legitimate style accessory in their own right.